Welcome to Iowa! Specifically, welcome to Van Meter, Iowa! Now, many of you may be asking yourself something akin to, "Just why in the world is David so jazzed about some little town in Iowa, for crying out loud?" 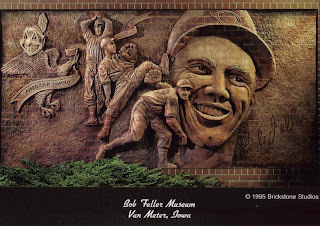 That's right, it is home to the Bob Feller Hometown Museum! Now, I have never been there myself. Instead, Joe, over at RedsCards took a little trip through there and sent me some cool gifts, including the tri-fold brochure above! In addition to that, he included a postcard with a closeup of the brickwork on the side of the museum!! Yeah, buddy! You got that right! That is Bobby Feller's auto in blue Sharpie on that card! SUH-WHEAT! This is a wonderful gift and surprise, Joe!! That is awesome! I'll put together a Reds pack as soon as I build up some more Reds cards, for sure!! Thank you, VERY much for these cool items! For those that are curious, the Bob Feller Museum is about 215 miles from the site of the "Field of Dreams" from the movie. And, yes, I looked it up. Now you understand why it was so hard to park an 18 wheeler there. It was worth the trip seeing the Babe Ruth bat, all of the stuff from his high school and early pro days. 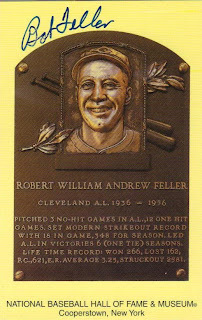 the HOF plaque card would look great framed or displayed with a ball. I live 20 miles from there and go every year it is awesome and Bob is a true ambassador for the sport!!!! Those are some neat items! Next spring, after our youngest son graduates from BGSU, we're going on a road trip. South to Louisville Slugger Bat Factory,Field of Dreams,Bob Feller Museum and St Louis Arch. Maybe we can get together ! I've been there too and purchased the same autographed Hall of Fame postcard. It's a great little place to visit, and the curator on duty when I was there was very friendly & helpful.